Can you help Kipling roll out fresh new category ideas for modern women in Asia? Besides Kipling’s current categories of handbags, backpacks, accessories and luggage, what else can it offer a woman in her 30s who lives in Asia, who holds an optimistic mindset towards life, with happiness and enjoyment being her priorities? Whether she isn’t yet a mother or a new mom, she feels young and energetic, and has a youthful outlook, and juggles a busy work and social balance in her life. She loves the quirky things in life and it’s the small things in life that make her smile. 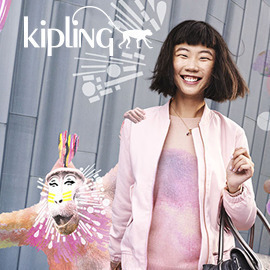 What new products can Kipling offer in Asia, that it currently doesn’t, that will bring a smile to her face and make her feel special? Format: Poster with a visualization of your idea and answers to the three questions, using the template provided.